Sandals includes some of the most challenging and prestigious golf courses in Jamaica, St. Lucia and the Bahamas. We’ve got everything down to a tee for every level of skill, even for those who want to take their first shot at it. Best of all, green fees are included. Any way you slice it, no other resorts give you more. The Web.com Tour returns to action at The Bahamas Great Exuma Classic at Sandals Emerald Bay for the season-opener in paradise. One of the finest golf clubs in the Caribbean, this course rises 700 feet above sea level and stretches out over a rolling landscape with sweeping views of the sea and mountains. Designed by golf legend Greg Norman, this award-winning golf course is recognized as one of the most scenic ocean-side golf courses in the Caribbean. 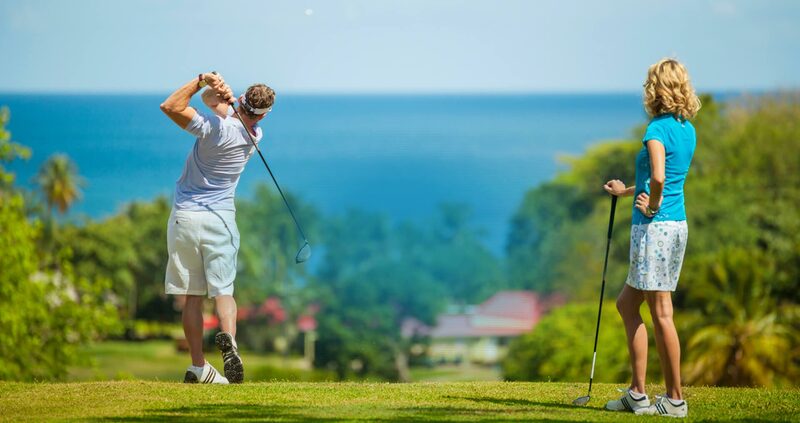 Enjoy two different golfing experiences in St. Lucia with your choice of a challenging 9-hole executive course or an 18-hole award-winning golf course. Enjoy golf with complimentary green fees at any of our all-inclusive golf resorts in Jamaica, Saint Lucia and the Bahamas. Our golf courses are perfect for every skill level. Best of all, free round-trip transfers are included from all our nearby Sandals Resorts.